Matrix Biolage Advanced Keratindose Shampoo for Overprocessed Hair 33.8 oz. This is a real authentic hair salon Matrix Biolage Product. This item is new. FRESH, unused, full, and the bottle is in good shape (as seen in the pictures). Matrix BIOLAGE ExquisiteOil Shampoo and Conditioner Duo. • 1 - ExquisiteOil Micro-Oil Shampoo Liter. Paraben-free conditioner formula is also suitable for color-treated hair. Oil infused haircare provides many benefits to all types of hair. Add to Favorites. Ending Soon. New Arrivals. MATRIX BIOLAGE. FOR DRY HAIR. Matrix BIOLAGE Advanced Fiberstrong Conditioner For Fragile Hair, 33.8 Oz. Fragile hair tends to feel dry to the touch, lacking shine and manageability. Paraben-free anti-frizz conditioner conditions and detangles, leaving your hair soft to the touch. Apply to wet hair and lather with a massaging motion. Rinse thoroughly. ULTRA HydraSource. Matrix Biolage. 33.8 oz / 1 Liter. How to Use. Dry hair often causes frizz, split ends and lack of shine. For very dry hair. Contains Aloe. You receive 2 bottles that are 33.8 oz / 1 liter each. 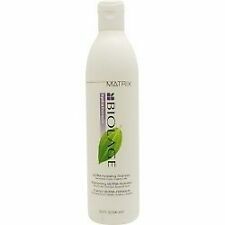 Matrix Biolage Hydra Source Aloe Conditioner for Dry Hair 16.9oz. Condition is New. Shipped with USPS Priority Mail. DEAL of Matrix Biolage Smooth Proof Shampoo and Conditioner 33.8 oz. This is a real authentic hair salon Matrix Product. This item is new, SALON FRESH. unused, full, and the bottle is in good shape (as seen in the pictures). Matrix Biolage Scalp Sync Anti Dandruff Shampoo 13.5oz - NEW & FRESH! Inspired by nature's expanding cotton flower. nature that mimic the expansive properties of the Cotton Flower. Quench your thirst for beautiful hair. Intensely conditioning for healthy looking hair. Color-treated hair. Paraben-free formula is formulated specifically for color treated hair. 5 out of 5 stars - BIOLAGE Ultra Hydrasource Conditioner For Very Dry Hair, 33.8 Fl. Oz. 6 product ratings6 product ratings - BIOLAGE Ultra Hydrasource Conditioner For Very Dry Hair, 33.8 Fl. Oz. MATRIX Biolage Smooth Proof Shampoo & Conditioner 33.8 oz Duo. Trending at $26.69eBay determines this price through a machine learned model of the product's sale prices within the last 90 days. Frizzy hair is often difficult to manage in humid weather. Smoothproof Shampoo. Smoothproof Conditioner. 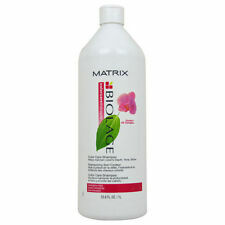 MATRIX BIOLAGE SMOOTHING CONDITIONER 16.9 OZ ORIGINAL! SMOOTHING CONDITIONER. 16.9 OZ (500ML). ORIGINAL FORMULA! For Sale: 3 Matrix Biolage Color Care shampoo 16.9 oz Brand new, unused, undamaged. This is a Liter Set of Matrix Biolage Smooth Proof Shampoo & Conditioner 33.8 oz each. Frizzy hair is often difficult to manage in humid weather. Smoothproof Shampoo. Smoothproof Conditioner. Matrix Biolage. Strengthening Shampoo. 16.9 oz - 2 bottles. Will create an instant lift, from root to tip. This is a Gallon Set of Matrix Biolage Hydrasource Shampoo And Hydrasource Detangling Solution. Hydrasource Shampoo. Hydrasource Detangling Solution. Matrix Biolage. Strengthening Shampoo 16.9 oz. Strengthening Conditioner 8.5 oz. Biolage smoothing shampoo is formulated with smoothing agents to nourish and help transform rebellious frizz into super-soft, manageable, healthy-looking hair. new and unused. Hair is instantly soft, shiny and manageable. Formulas with purifying citrus or nourishing soy protein bring hair's natural brilliance to light. Made in USA. Wet hair and lather with a gentle massaging motion. It seals the cuticle to lock in colour and intensify shine. For Sale:1Matrix Biolage Color Care Conditioner 16.9 oz. It strengthens weak. over-worked hair as botanicals deeply condition. Repeated use continues to improve hair's healthy look and natural shine. DETANGLING SOLUTION. ALOE ANTI DRY CARE. (White Formula)! 16.9 oz (500 ml) each. All products are never used, working condition. 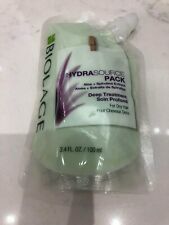 Biolage•HydraSource Shampoo•33.8 Oz•Brand New!Fast Ship!